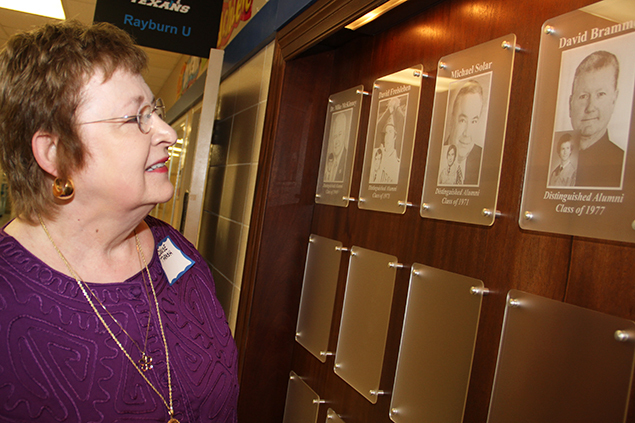 Municipal Court Judge Denise Thrash admires the new Sam Rayburn High Hall of Honor displayed in the front of the building. 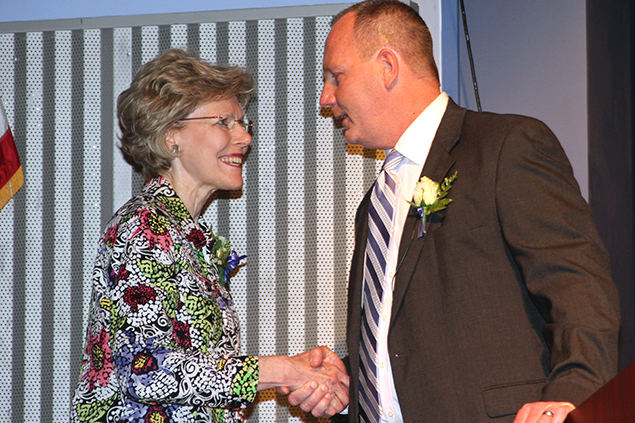 She joined hundreds of Rayburn alums, school district officials, family and friends recently in celebrating the school’s 50th anniversary and the induction of the first group of alumni and former teachers selected for the school’s new Hall of Honor. View more photos below. “A love of education, a love of service and above all, a love of fellow man.” It’s been 50 years, but members of the first graduating class have no trouble remembering the Sam Rayburn High School creed because it has become a model of their existence. Former chancellor of the Texas A&M University System and keynote speaker, McKinney joined several hundred Rayburn alums, school district officials, family and friends recently in celebrating the school’s 50th anniversary and the induction of the first group of alumni and former teachers selected for the school’s new Hall of Honor. A frosted glass plaque display of Hall of Honor inductees captivated alums as they walked through the front entrance of their old alma mater. A committee of current faculty and staff at Rayburn made the selections with input from other alumni and former faculty members. After a brief walk through, visitors gathered in the auditorium to hear School Superintendent Dr. Kirk Lewis and watch student performances by the marching band, Tex-Anns drill team, Junior ROTC and cheerleading squad, followed by two video presentations. The first video shared decade-by-decade memories dating back to 1964 all the way up to 2013. The last video was a special tribute to alumni, on behalf of students in every campus organization. The video presentation was their way of thanking graduates for building a legacy of success for students to model at Rayburn. 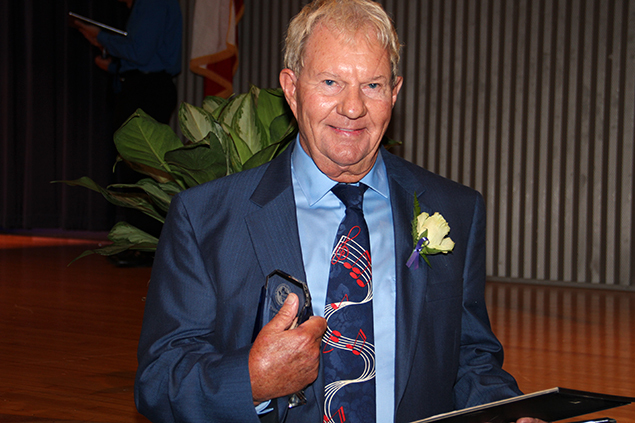 The main event was the induction ceremony. 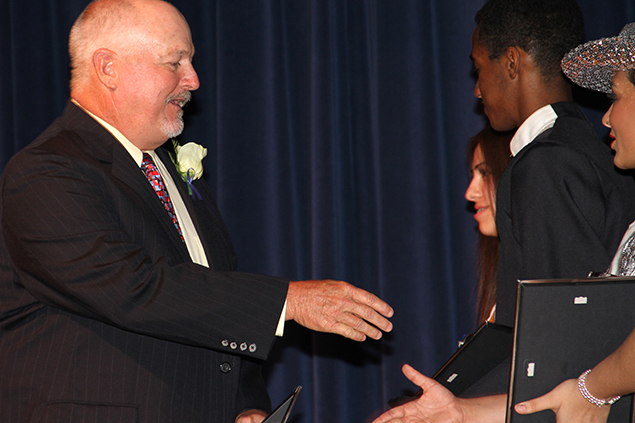 Principal Robert Stock announced all nine inductees and presented them with an elegant crystal plaque, while a group of students presented framed congratulatory letters, written by leaders in various campus organizations. No one was happier or more sentimental about the anniversary celebration than Betty Baker, who retired in 1994 after teaching at Rayburn and serving as director of the Tex-Anns for 26 years. Another returning graduate echoed Baker’s sentiments. 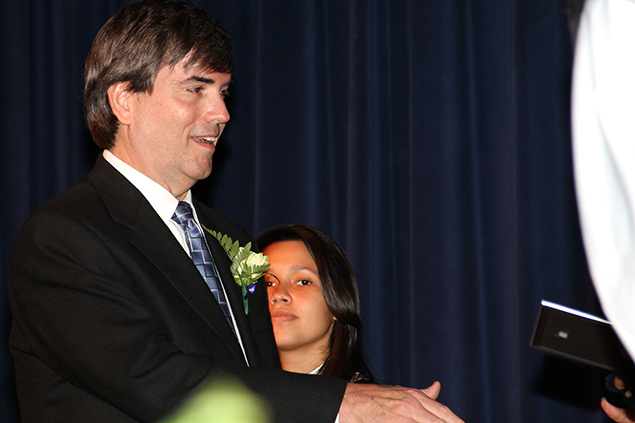 One could barely hear a pin drop as Principal Stock talked about the final inductee, the late Carter O. Lomax, the first principal of Rayburn High School. 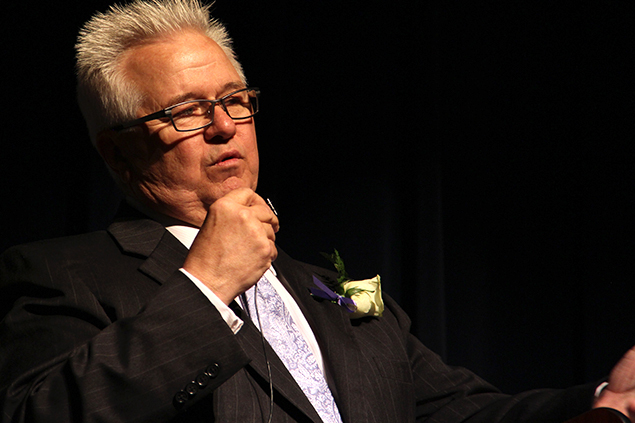 After the announcement, his daughter Lora Haschke walked across the stage to accept the honor on his behalf. 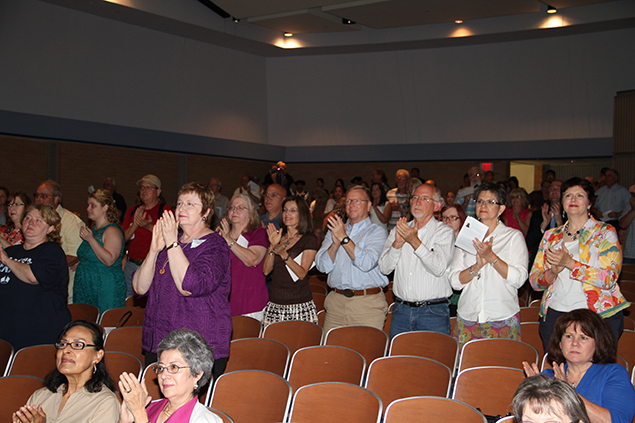 A long standing ovation followed as attendees reflected on his legacy. 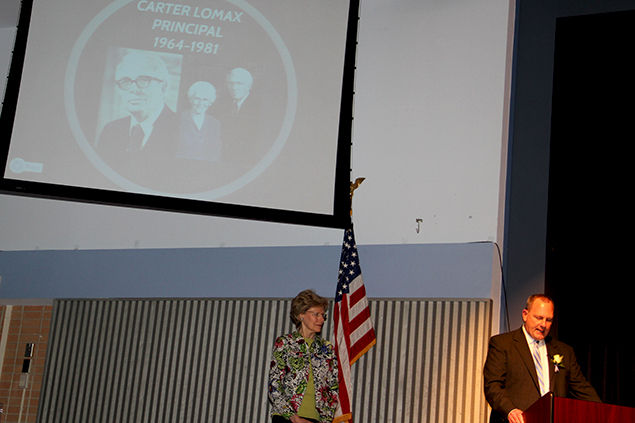 The late Carter O. Lomax, who served as Sam Rayburn’s principal from the school’s opening in 1964 until his retirement in 1981, was honored as a member of the Texans’ first class of inductees. The school opened on Sept. 2, 1964, the first day of the 1964-1965 school year. An open house was held four days earlier with members of the Sam Rayburn’s Future Teachers of America chapter on hand to conduct tours for the public. The school was so new, construction cleanup was still under way in parts of the campus. Sam Rayburn’s first student body consisted of a complete load of seniors, juniors, sophomores and freshmen. It was commonplace for seniors to be exempt from a transfer to a new high school, but Sam Rayburn immediately inherited a senior class – the Class of 1965. The school drew students from both Pasadena High and South Houston High, which had opened only seven years earlier. The area’s population growth was reflected in a need to open J. Frank Dobie High – the district’s fourth high school – just four years later. The changes were so rapid, some Pasadena families could eventually boast of graduates from Pasadena, South Houston and Sam Rayburn. The school was named after one of the most politically powerful Texans of the 20thCentury. Sam Rayburn, a member of the U.S. House of Representative for 49 years and the Speaker of the Houston for 17 years, died in 1961. The name given to the school was part of an effort by the school district to name new high schools after distinguished Texans. Hence, the district’s fourth high school was named after famed Texas author J. Frank Dobie. An effort was even made to rename Pasadena High and South Houston High after some of the heroes of the Alamo. Suggestions included William Travis, Davy Crockett and Jim Bowie. The effort was met with strong resistance and the original school names were retained. 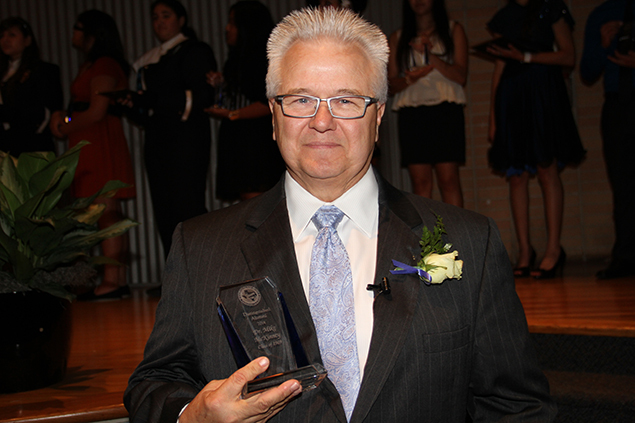 Sam Rayburn's assistant principal during those early years was Allen Sory, who would go on to become Dobie’s first principal. The Texans’ football team, which had been practicing for weeks before the school opened, immediately plunged into varsity competition, despite the fact that many senior lettermen had been exempted from transfer. Under Coach James McNeil, the junior-led team posted a 2-6-2 record that included a season-opening victory over Spring Woods. 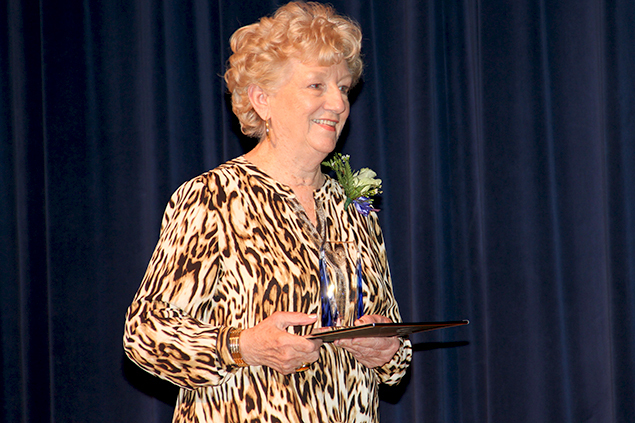 The late Carter O. Lomax, who served as Sam Rayburn’s principal from the school’s opening in 1964 until his retirement in 1981, was honored as a member of the Texans’ first class of inductees.Pictured here: His daughter, Lora Haschke.